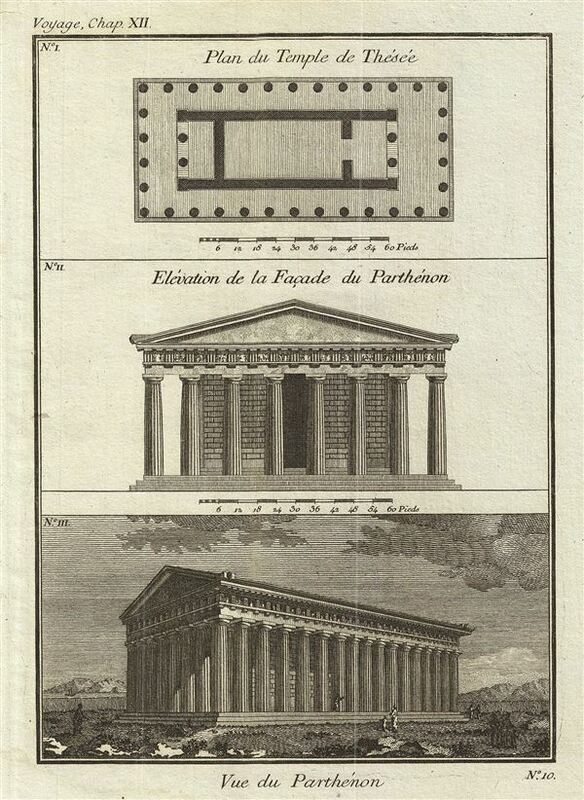 Plan du Temple de Thesee. Elevation de la Façade du Parthenon. Vue du Parthenon. This is a fascinating example of the 1791 Bocage plan featuring the Temple of Theseus (Temple of Hephaestus or Hephaisteion), the elevation of the Parthenon, and a view of the Parthenon. The Temple of Hephaestus, located in the Agora of Athens, is considered the world's best-preserved ancient Greek temple. In the 18th century the Hephaisteion was believed to be a temple dedicated to Thesues (as noted in this map) and the resting place of the mythical hero Theseus. However the inscriptions inside the temple later reveaed that it was in fact the Temple of Hephaestus. The Parthenon widely considered the highest expression of Doric architecture, also featured here, is dedicated to the Greek goddess Athena. Prepared by M. Barbie de Bocage in 1791 to illustrate the Travels of Anacharsis.